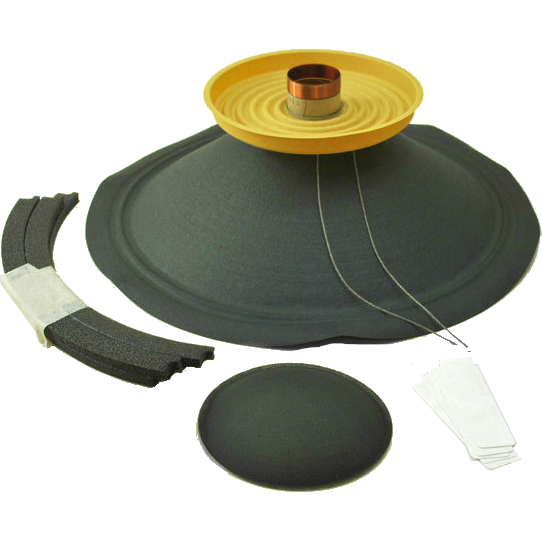 Original Celestion Guitar Speaker Recone Kit. For 12" Celestion Classic Series G12H Anniversary Edition (30W) P-A-G12H-8 and G12M Greenback (25W) P-A-G12M-8. Not for Heritage Series or Creamback Series. Includes: Pre-assembled Cone / Voice Coil / Spider / Lead Wires, Dust Cap, Gaskets, and Shims. Does not include instructions or glue. 16 Ω K-RC-G12MH-16 Packaging Dimensions 14.5 in. x 14.5 in. x 6.5 in. 16 Ω K-RC-G12MH-16 Weight 1.9 lbs. 8 Ω K-RC-G12MH-8 Packaging Dimensions 13 in. x 13 in. x 5.5 in. 8 Ω K-RC-G12MH-8 Weight 1.65 lbs. 1 answers Do you have a recone kit just for celestion G12H 100w, 8 ohms? Let me know and thank you! It does not appear as though we carry a kit for the 100w G12 in house. A special order through Celestion may be possible. Please call 480-296-0890 for any details. 1 answers I have two Celestion G12H with 55Hz cones. Does the recone kit K-RC-G12MH-16 fit? I want to have the 75Hz sound. These do not work with the Heritage series speakers. 1 answers Hey, just wanted to ask if you ship to germany, and if so what the shipping costs would be. thanks! Please contact us at: info@amplifiedparts.com for shipping inquires. 1 answers What is the difference between this kit and the G12T kit? The the G12T kit is a recone for the Celestion G12T-75. This kit is for the G12H Anniversary and G12M Greenback. 1 answers Do you carry a recone kit for a G12L celestion? We do not carry a recone kit for a G12L at this time. Recone Kit - Eminence®, for Omega Pro 18ARK 18"
Recone Kit - Eminence®, for Omega Pro 15ARK 15"
Recone Kit - Eminence®, for Legend CB158RK 15"
Recone Kit - Eminence®, for Legend CA10-8RK 10"
Recone Kit - Eminence®, for Legend CA10-4RK 10"